1. Melt the butter and the Margarine in a deep saucepan over a low heat2. add the brown sugar and 2 tablespoons of golden syrup and stir in until you have a brown paste3. add in the oats, if you find it easier add them in gradually stirring and covering the oats with the paste4. add a pinch of salt and continue to stir5 . spread the mixture evenly over a non stick baking tray6 . Place the baking tray onto the middle shelf in a preheated oven (gas mark 5, 220 C) and bake for 18 minutes, checking the progress regularly. Take out when the mixture starts turning a golden brown.7 . Stand for a minute or two, then score the mixture with a knife into you portions8 . Cover the tray with something light such as a few pieces of kitchen roll and leave for up to 6 hours9 . 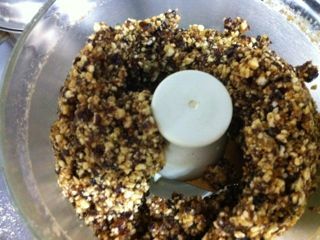 Melt the dark chocolate and spread over the cooled flapjack, allow to cool in the fridge for an hour or so10. Voila, serve the flapjack to you friends and bask in glory and this great accomplishment. Serves: 10-15Prep time: 15 minsCooking time: 25 minsIngredients:9 oz / 250 g butter→植物性マーガリン9 oz / 250 g caster sugar→メープルシュガー6oz / 175 g golden syrup or molasses→メープルシロップ16oz / 450 g oatspinch of ground ginger2 apples, peeled and choppedPreparation:Line an 8×12 cake tin with parchment paper and preheat oven to 350°F/180°CCombine butter, sugar and golden syrup in a pan, stirring to melt until the sugar has dissolved.Remove from heat and add the apples and ginger, then the oats.Transfer mixture to the cake tin and spread out evenly. Bake for 20-25 minutes.Cut into 10-15 slices and allow to cool before removing from cake tin. Copyright © Keikoh Izawa All Rights Reserved.